The success of Elder's Legacy and the enthusiasm shown for Shadowsfall Promo on gEngine prompted this more ambitions project. Tainted Glimpses is a 100 card fan-made set, with the design work shared between more than 10 people. 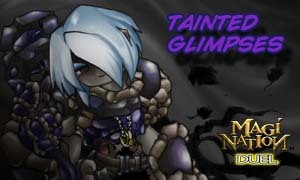 Submissions were solicited for card ideas and some of the best card ideas were used in Tainted Glimpses. Artwork was found to shoehorn into some of these card ideas. Other cards started life out with the artwork available and no text, but these were few and far in between in this expansion. The following Promo cards were developed to go together with Tainted Glimpses.